We hope this site can help you to find information about our church and about the faith we confess. 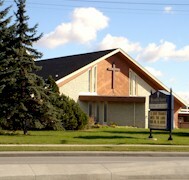 Our church is a congregation of Lutheran Church-Canada. You are more than welcome to attend our Sunday services at 10:30.